Niilo (Neil) Jalmari Maukonen was born the middle son of 5 brothers, Carl, Henry, Norman and Eric to Kalle and Edla Maukonen. born 1909, died 1976. Neil followed in his father?s footsteps, as a men?s custom tailor (and later as a designer). He started his career with the T. Eaton Company and then went to work at Warren K. Cook (a wholesale manufacturer of men?s quality clothing). Later, he joined Ed Provan, an exclusive men?s shop on Yonge Street in downtown Toronto and was there for many years. He opened his own shop in the King Edward Sheraton Hotel to work in close association with a close friend, Chris Wahlroth, designing and hand-tailoring both men?s and ladies? clothing. Neil was well known for his skill in costuming male figure skaters. As well, he created fine suits for clients who included ?VIPs? such as E.P. Taylor and Jack Kent Cooke. 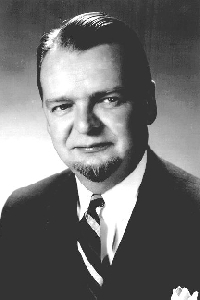 (Cooke later moved to the U.S. and owned many sport franchises including the Washington Redskins). He was a walking advertisement for his own clothing, always looking fashionably attired with the latest in fabrics. Neil married Georgina (nee Robinson) in 1931 and they had four children. Sons Neil Allan Jr. (whose wife and family now live in Orillia, Ontario) and Robert Edwin are both deceased. Daughter Cathy lives in Toronto and Jackie lives in Vancouver. In his leisure time, Neil was an ardent fly-fisherman, hand-tying his own lures. He loved to cook and entertain family and friends. He achieved a life-long dream when he took a trip to Finland and Ireland in 1972. During the trip to Finland, he used much of the time researching possible connections with the Canadian Maukonens. He passed away in 1976 from complications of lung cancer. 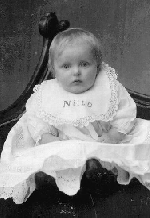 Neil was born in Toronto but this baby picture was taken in Helsinki when Kalle and Edla returned to Finland for a short time.